Barista Sugar for Coffee. With rich caramel notes. Natural unrefined cane sugar. Suitable for Vegetarians & Vegans. Our unrefined sugar has been very carefully produced to lock in, rather than refine out, the natural molasses of the sugar cane. It is this difference which gives Billington's sugar its unique richness, depth of flavour and colour. 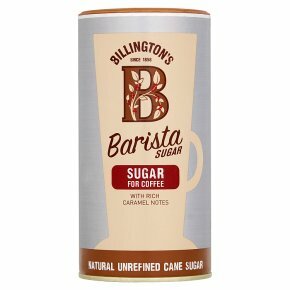 Unrefined demerara sugar for coffee specially selected for its rich caramel notes, deliciously complementing coffee Billington's is the difference you can taste.